Apple always tries to seed the iOS versions to make it something unavailable for a jailbreak. This is to prevent them from jailbreaking the iPhone and the iPad, and now for the latest iOS versions, i.e. the iOS 4.3.4, is modified with a fix on the PDF loophole which was allowing the 3rd party content from the backdoor. JailbreakMe was the tool which was being used to jailbreak the phones and use the code to modify the iOS so that the external content could be brought into the Apple devices running the iOS operating system. Such code of jailbreak could be beneficial and harmful to the users, as sometimes these codes could help in sending malicious software into the devices. A warning to all the iPhone, iPad and iPod touch users who are using the versions lower than the iOS 4.3.4, do not upgrade to this version if you want to stay jailbroken and avoid phone to get locked from being jailbroken in the future versions. And to avoid any malware attack in your device, you can close the backdoor entry of any stuff by using the PDF Patcher 2 which can be installed using the Cydia app in your jailbroken phones. The SHSH Blobs of 4.3.3 need to be saved by users if they want to use this same version of firmware in future, although Apple force updates the devices to the later versions. The update iOS 4.3.4 is now available in the Apple website, and those who want to stay safe and update their devices in the phones which are not jailbroken, they can do it to stay safe forever but the users who have their devices jailbroken, should better avoid this version. Saving the SHSH Blobs would be helping the users get back to the previous version of the iOS using those blobs. Tinyumbrella can be used to get back to the previous versions. In May, reports suggested that fake antivirus software, specifically targeting Apple computers, had been collecting credit card details from users by scaring them of non existent virus attacks. Web security company Intego said that it had discovered fake antivirus softwares that have been targeting Apple users starting early May. 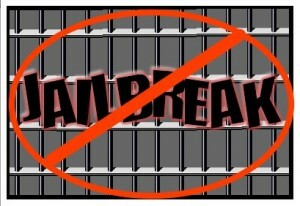 For those who just want to go safe, you can remove jailbreak from your iOS device anytime.